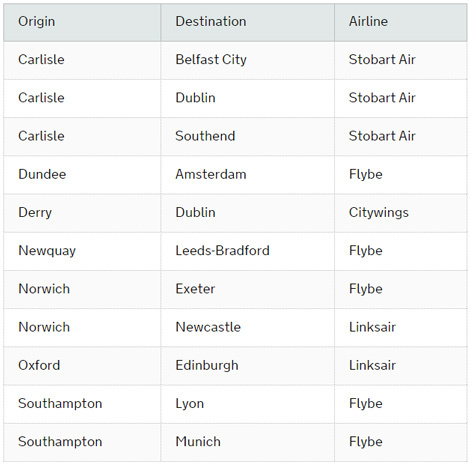 Flybe has announced details of its new domestic route between Exeter and Norwich airports. The service will launch on March 24, with six flights per week and fares from £17.49 each way. Flights will depart Exeter at 1205 (Monday to Friday) and 1045 (Sunday), arriving at 1315 and 1115 respectively. The return leg will leave Norwich at 1520 (Monday to Friday) and 1220 (Sunday), landing back into Exeter at 1640 and 1340 respectively. 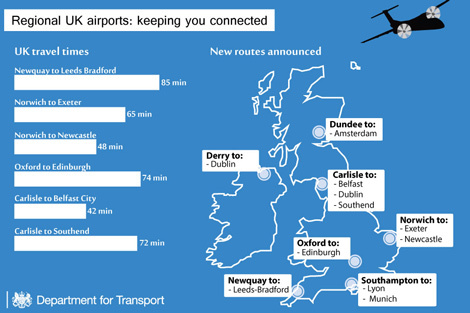 The new route is a result of the UK government’s Regional Air Connectivity Fund (see news March 2015). The government invited proposals for commercial services to be operated on a shortlist of new international and domestic routes to and from UK regional airports handling fewer than five million passengers a year. A list of the successful routes and their carriers can be seen below.